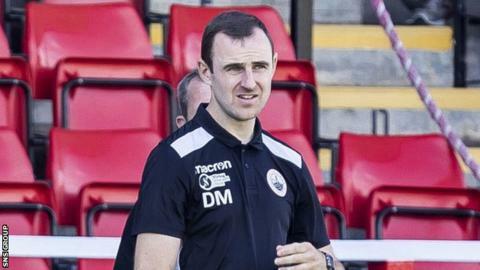 Stirling Albion have sacked manager Dave MacKay following a 3-0 defeat away to Albion Rovers. The Cliftonhill side's first League Two win of the season leaves the division's bottom side two points behind the Binos in seventh place. An early goal from Lewis Mclear and a brace from Ryan Watters sent Rovers on their way and ended MacKay's tenure, which began in November 2016. Edinburgh City remain two points clear at the top of the table after a 1-0 home win over Cowdenbeath. Former Kilmarnock defender Conrad Balatoni headed home the only goal from a corner on the hour to give City their seventh win from eight league games. Peterhead remain second after a 3-1 win at fourth-placed Annan Athletic, Ryan Dow, Rory McAllister and Jason Brown all on the scoresheet for the visitors. Clyde won 3-2 at Berwick Rangers to stay third, three points off the top. Danny Lennon's side trailed 2-0 at half-time to goals from Stephen Scott and Jack Ogilvie, but David Goodwille and Karim Belmokhtar brought Clyde level by the 53rd minute and Belmokhtar's injury-time winner took the points. Clyde are five points clear of Annan and Elgin City, who beat Queen's Park 2-1 to move five points above their opponents, Shane Sutherland's penalty securing the win two minutes from time.